Our 30 minute thrilling experience will have your adrenalin pumping! 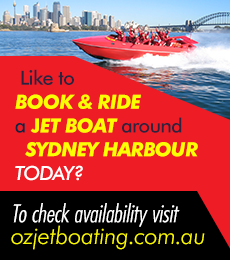 Although the jet boat ride departs from the calm waters of Circular Quay, it doesn’t take long before the huge engines get you speeding up and ready for some amazing thrills! 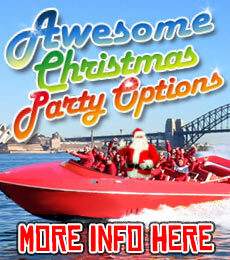 The Jet Thrill Rides takes you on a massive hot-lap of Sydney Harbour. Hold on tight as your driver unleashes the power of our massive diesel engines! Now it is time to give you a taste of what jet boating is all about – from radical fishtails, awesome spins to sweeping slides. We head under the Sydney Harbour Bridge, past the Opera House and fishtail all the way to Watsons Bay. Here we take you for more high-speed spins before making our way back past Bradley’s Head, Kirribilli and Luna Park and then re-entering Circular Quay with huge grins and applause for our fabulous drivers! We even capture the moment for you! Rides operate on Saturdays and Sundays and additional days during NSW School holidays. Bookings essential. *Please make sure you read and understand our terms and conditions before booking.